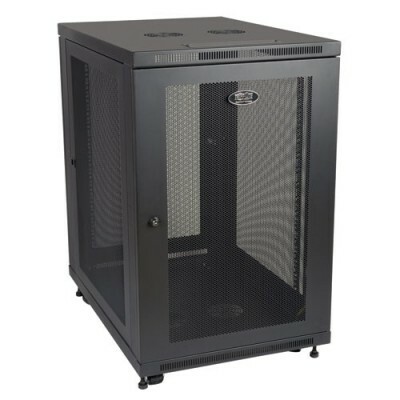 Tripp Liteâ€™s SmartRack 18U Mid-Depth Rack Enclosure Cabinet is packed with features designed to simplify rack equipment installations and rack equipment maintenance: top and bottom cable routing ports, perforated door and side panels to promote efficient airflow, adjustable vertical mounting rails and more. And as part of the SmartRack family, the SR18UB is compatible with Tripp Liteâ€™s extensive range of rackmount accessories, enabling you to customize your solution to meet any requirement. The SR18UB ships fully assembled for quick installation and comes with a 5-year warranty. The SR18UB is compatible with all standard 19-inch rack equipment and features front and rear pairs of vertical rails with square mounting holes. The rails are adjustable in quarter-inch increments to accommodate equipment depths from 3 to 32.5 inches, ideal for standard server installation. Adjustment is quick and convenient: simply unscrew the rails, slide them to the desired depth and restore the screws. The rails feature square mounting holes and are capable of supporting up to 453 kgs (1000 lbs) of equipment with included installation hardware. Each rack space within the enclosure is numbered for easy reference. With a locking, reversible front/rear doors and locking, removable side panels, the SR18UB provides safe, secure installation for all equipment. This prevents unauthorized access to installed equipment while making it easy for authorized personnel to perform inspections, maintenance and equipment replacement. The enclosure meets all requirements toward PCI DSS compliance. The top and bottom panels of the SR18UB are furnished with vents designed to help remove warm air from the enclosure and draw in cool air by convection. They also support installation of standard user-supplied case fans (Tripp Lite SRFANWM). The top and bottom panels are also provided with ports for cable routing. To simplify deployment, the SR18UB comes with an accessory caster kit consisting of 4 casters and all required installation hardware. With casters installed, the SR18UB can easily be maneuvered into to desired location, and then secured in place by adjusting the unitâ€™s levelers. Note: the casters are intended for minor position adjustments within the final installation area only and are not designed for moving the enclosure over long distances.